Sjögren’s syndrome (pSS) is a common systemic autoimmune disease which primarily affects the salivary and lachrymal glands and usually leads to a persistent dryness of the mouth and eyes due to the lymphocytic infiltration and functional impairment of the exocrine glands. The disease is commonly included in the spectrum of connective tissue diseases (CTDs), and together with the other members of this disease family, it shares the possibility of a multisystemic involvement, a variable clinical picture, and a very large range of clinical and serological manifestations. Cutaneous manifestations are considered one of the most common extra-glandular features of pSS and can be distinguished as nonvascular lesions (i.e., xerosis, angular cheilitis, eyelid dermatitis, annular erythema) and vascular lesions (i.e., Raynaud’s phenomenon and vasculitis). 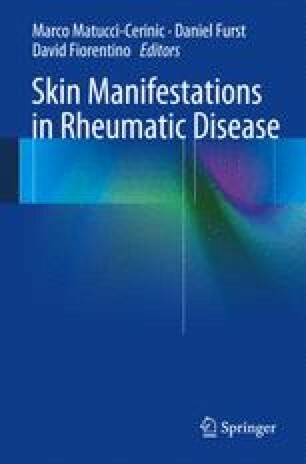 In this chapter, the definition, differential diagnosis, and histological features of skin manifestations in pSS will be provided. We thank Laura Maria Fatuzzo for her valuable contribution in reviewing the text.